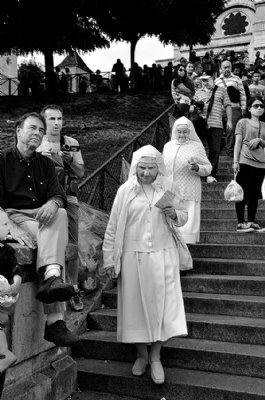 Image Title: Two nuns,and two friends. About and they the four are friends. Thank you so much my dear Paul. I usually leave the exif and metadata attached to my photos ,so you can easly download any photo of mine and the info attached to it . This image was shot using Nikon D3.my best two lenses that I used during this trip are Tamron 24 or 28 to 270mm , and nikon. 80-400mm . Two persons in the image are and still my friend ,in reality I do not know the lady nuns ,but I know exactly how they look and feels towards humans ,any human famillar or non ,the love and like all the human beings ,even their own enemis .So if they love me as a human ,no matter who I am ,aren't they worth the title of friend ? And more over a close friend . Stay well and fine and please do accept my best regard. Classic shot. Reminds me of the photo exhibitions during 80s. Enjoyed the view. If it is a candid, how to know that they are friends? It is not a congruent About. Saad you are a master. Its hard to comprehend the clarity your are getting. What type of camera and lens are you using?